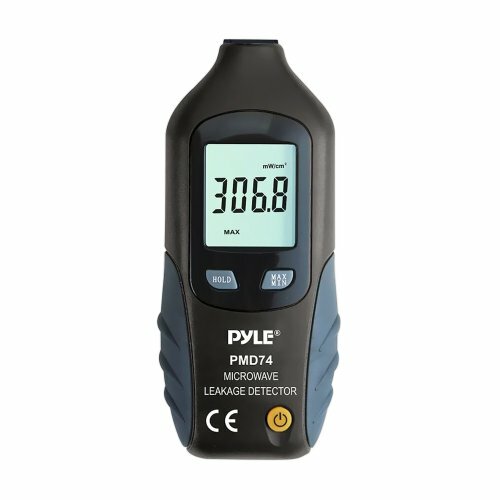 The PMD74 is a microwave leakage detector from Pyle. This device never needs calibration and allows you to accurately and precisely measure the amount of radiation emitting from your microwave. Measures from 0 to 9.99 mw/cm2. The PMD74 will automatically signal a warning beep and LED flash if the detected radiation is above safe levels (5 mw/Cm2). Make sure your microwave is functioning properly and get piece of mind with the PMD74. On a 9V battery, the PMD74 operates for one year. LCD Digital Readout Alarm Beeps / LED Flashes In Dangerous Zones Design Suitable For Use In Either Hand Battery Operates For More Than 1 Year Never Needs Recalibration Highly Sensitive Excellent Reliability And High Precision Calibration: 2450mhz Measurement Range: 0-9.99mw/Cm2 Warning: 5.0mw/Cm2 Accuracy: +/- 1dB Power Supply: 9V Battery Sold as: Unit Weight: 0.47 lbs.